Dalma is an unique, traditional and famous delicacy from the state of Odisha. 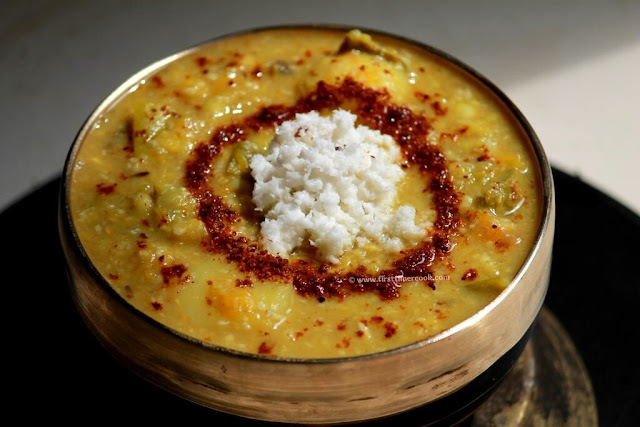 Basically it is a type of dal cooked with different nutritious vegetables and less spices. This dish is easy to prepare, also packed with proteins from the dal & minerals, vitamins from vegetables; so it is the perfect combination of taste and health. Dal can be of toor (arhar) dal, split green gram (moong dal). In case of moong dal, first dry roast them before using. Vegetables typically can be of potatoes, raw banana, green papaya, pumpkins etc. Dalma mainly seasoned with a tempering of jeera, bay leaves, dry red chili in pure desi ghee, by which the dish becomes much more aromatic. When you are not in a mood for any spicy curry, then just go for this aromatic and wholesome odisha special dalma. So below is the step by step procedure of dalma. Clean and wash all the vegetables and dal thoroughly. Take a pressure cooker with adequate amount of water (4 cup approximately). Add in dal, all the vegetables, crushed ginger, salt and turmeric powder. Mix well and cover the lid. Cook in medium flame for 1 whistle. Turn off the heat and let the pressure goes off automatically. Heat desi ghee in a pan on medium flame. Add cumin seeds, bay leaves, dry red chilis. Stir fry for a few seconds. Then pour on the dal and vegetable mixture in pressure cooker, give it a stir. Add some water to adjust the consistency of the dalma if required. Give the mixture a quick boil and turn off the heat. Finally sprinkle roasted chili-cumin powder and grated coconut. Stir well and serve the dalma with steamed rice / roti ! Always roast the moong dal / split green gram before use. Consistency of dalma can be of thinner / thicker depending upon choice.